Download this walk to your PC or mobile device now for just £1.60! Each walk download package contains a video showing detailed directions of the walk, an Ordnance Survey map extract of the walk together with loads of pictures along the way. Also provided is a PDF document containing walk directions with pictures and an Ordnance Survey map extract of the walk area for you to print out or view on screen. The video is available in 3 different resolutions (see table below) so you can download the one most suitable to your device. If mp4 is not for you, there is also a hi-res version in the wmv format provided. All files can be downloaded immediately after purchase. See below for approximate download times. There is a limit of 10 file downloads per package. 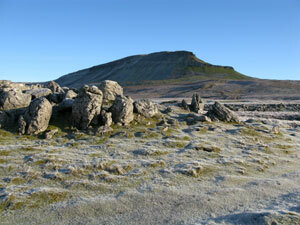 Videowalks has produced a 25 page guide to help you prepare, plan and complete the Yorkshire Three Peaks Walk, whether it be the entire walk or just part of it. The guide describes what you should do before the walk by way of preparation including detailed sections on what to wear and equipment to take with you. It also describes how to prepare yourself physically for the challenge. The guide goes on to explain what you should do before the start of the walk, during the walk and after the walk including advice on safety, weather, food and drink together with a selection of frequently asked questions and important contact details. The guide is available to buy on its own for £1.30 or it can be purchased along with your walk download at a reduced price. Payments are processed on behalf of Walks4all Limited by PayPal - a PayPal account is not required. In order to download via our Insta-Login facility, your current IP address will be associated with your purchase.